As the year is coming to a close, it’s good to reflect on all the web development trends and changes that have happened. Parallax scrolling was a breakout hit this year, as was animation and flat design. But now it’s time to look to the future. That’s why we’ve put together our predicted web development trends for 2017. 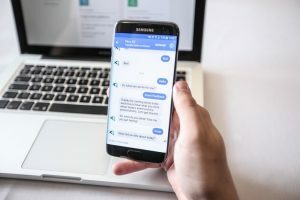 Chatbots have exploded onto the web development scene this year — but unfortunately a lot of them are more annoying than helpful. They’ve been around for a while, but with the popularization of Siri, we’re beginning to look to chatbots to answer all of our questions. Developers are excited about using chatbots to make sales, assist customers, and more. There are still many kinks to work out, but we can except more chatbots as one of the web development trends for 2017. Rails 5, the most recent version of the coding language Rails, was released this past June. With new features, we expect it to grow in 2017. Some of the new features include Turbolinks 5 and ActionCable. Turbolinks 5 makes it easier for developers to create Single Page like Applications. ActionCable simplifies creating chat feature and notifications. Whether that made sense to you or not, developers should be excited. Static images, unfortunately, do not excite Internet users anymore. Animation, videos, and GIFs are what’s popular now. We only except this to continue as a web development trend for 2017. If you do use images, they’ll need to move in one way or another through animations. GIFs and videos are as popular as ever; they’re used because they hold the interest of visitors. Really, who knows what’s in store for next year? The Internet changes rapidly. But we hope to see our predictions for web development trends for 2017 to come true!